That is it! I’m getting an iPhone! The addi+ions blog over at digital-telepathy has posted the news that Starbucks, more affectionately known to Nic and I as Buck Buck’s, has just gone seriously mobile with a new iPhone application! 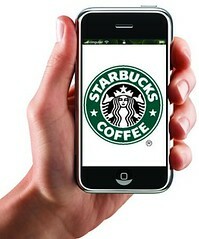 That’s right coffee lovers, you can now order and purchase your drink of choice outwith the line, via your iPhone. It’s not clear exactly how the system works, but the interface looks smoooooth and we all love an original app! September 11, 2001 – Where were you? http://www.genoco.com/ – designer Phil Lu – at least give him a link! Thanks for the coverage! I seriously want an iPhone now too. Let me know if you ever try out the app – I look forward to learning more about the usability of the system. No probs. Your post really caught my eye, Starbucks, iPhone, what else is there?! Gotta love those happy endings…. Cheers for correcting my lack of linking! Can’t believe I dropped the ball there.